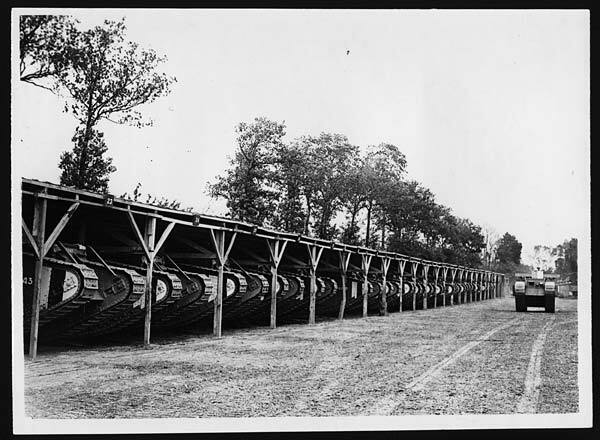 British tanks, lined up in their sheds/stables somewhere in France. 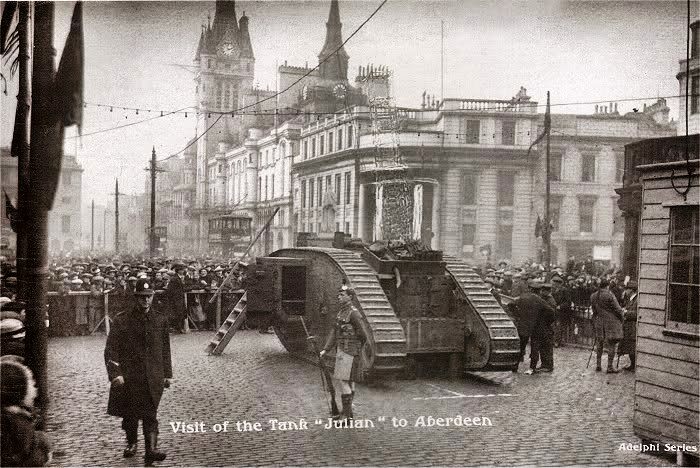 Tank 113 ' Julian ' on display in Aberdeen. 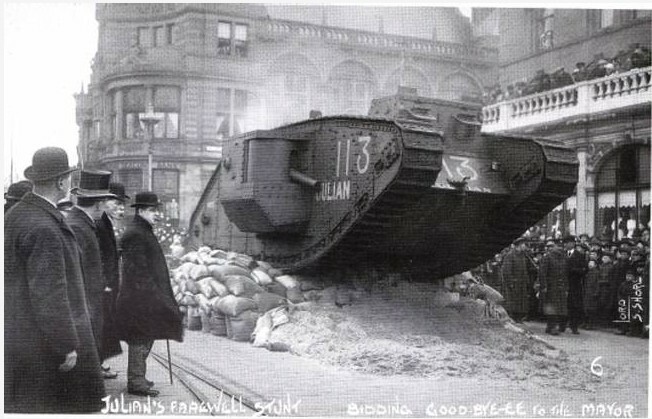 Tank 113 ' Julian ', giving a farewell display of a tank's manoeuvrability. More fantastic pictures. 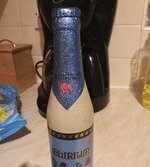 Julian certainly got about. Pleased you found them interesting. Apart from collecting WW1 rifles, hand guns, swords, bayonets and Officer's cuff rank jackets, my other main area of WW1 interest is photographs, which I shall continue to share. 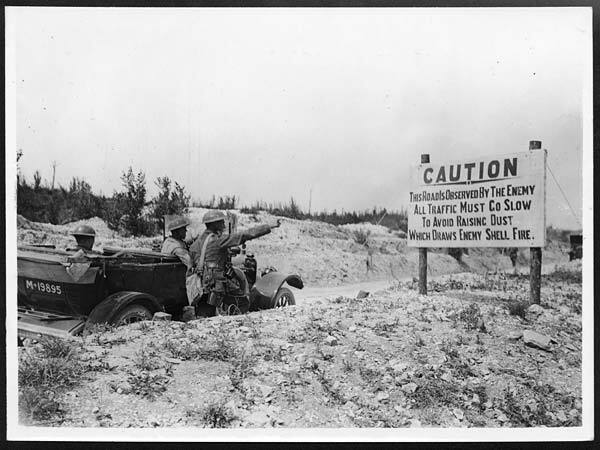 One of the lesser known services performed by the Army Service Corps ( ASC ), was the ' De-poisoning and sterilising ' of water supplies for the Army. 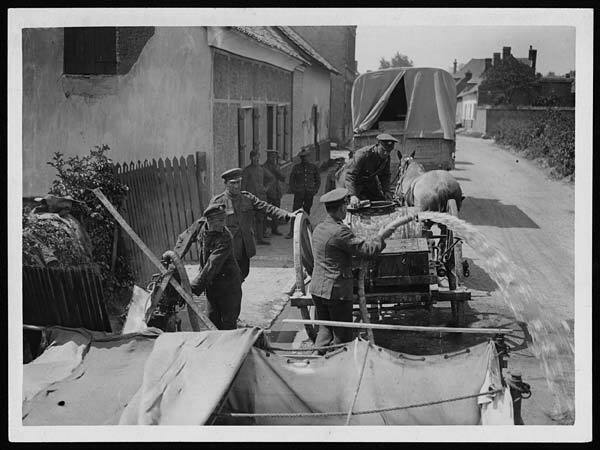 When the Germans retreated from towns and villages, they would often deliberately poison or contaminate the drinking water supply, knowing that a good supply of drinkable water was vital to any army. The role of the ASC De-poisoning and water sterilising units, was to locate a suitable water supply, test that water for poisons or contaminants, purify and filter that water, making it drinkable, store and distribute that drinkable water. The ASC unit, having located a water supply, which in this case was a local river, would then draw water from that supply for testing in their mobile water testing vehicle. In the following series of photographs taken in France, we see in the first photograph, a member of the ASC unit lowering pipes into the river to draw off water samples for testing. Water from that supply, is then pumped to the ASC mobile water testing vehicle, where it is tested and filtered through sand filters, with the then tested, purified and drinkable water flowing into large canvas cisterns for storage. In another photograph, we see a Lieutenant supervising a sergeant who is taking water samples for further analysis. Finally, drinkable water from the filtering process, is pumped into canvas water tanks for storage and distribution to the troops, this process is shown in the third photograph. Also, in this photograph we can see an interesting ( ASC ? ) Divisional/Unit badge on the top of the vehicle, which someone may be able to identify ? 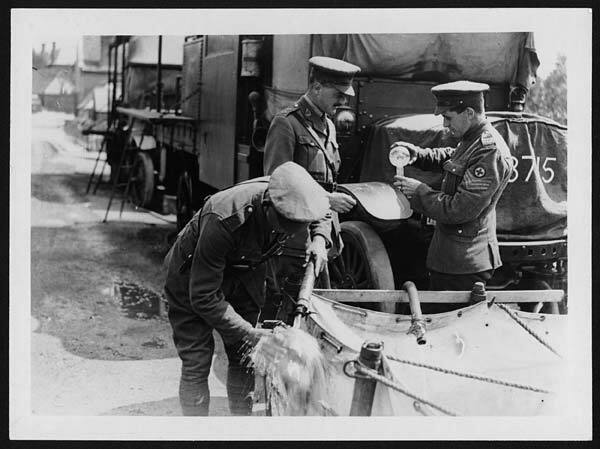 , and a member of the unit giving clean water to two American servicemen. In the final photograph, we see a horse-drawn water tank taking on water from the ASC drinkable water canvas storage cisterns. 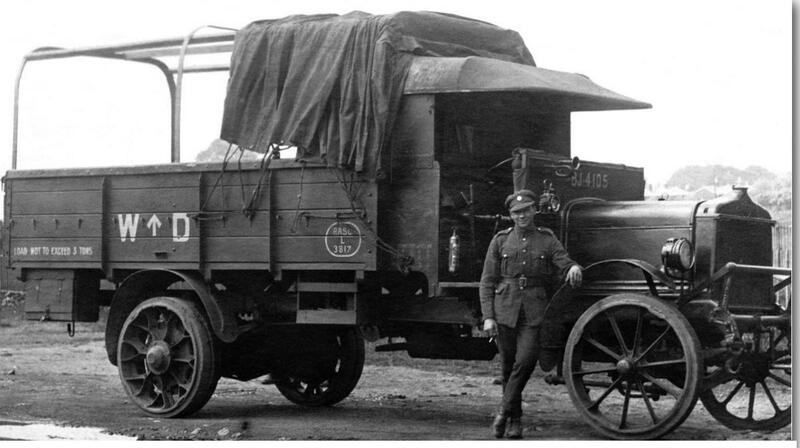 Excellent detailed photograph of an Army Service Corps ( ASC ) ' AEC Y Type ' 3 ton lorry taken in Mesopotamia. An Army Service Corps. 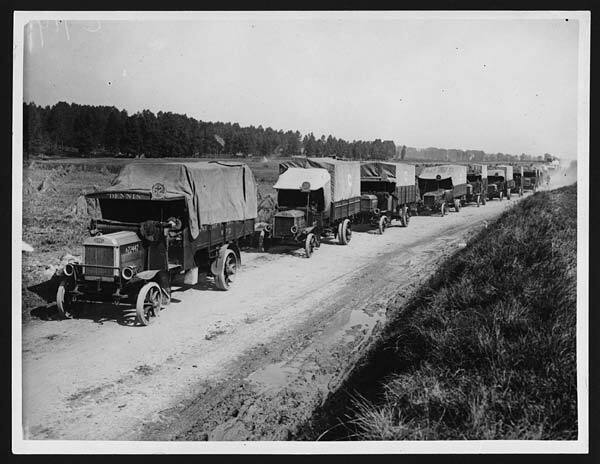 ( ASC ) transport convoy, led by a ' Halley ' lorry. Is that a fire extinguisher to the chaps right? EDIT refering to post 533. ASC the undervalued corp! 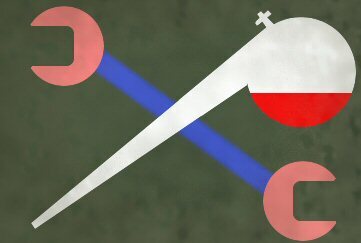 I thought water purity was an RE job, looks like in the 1st world war there was a lot of duplicated units badged to RE and ASC. Yes, it is a fire extinguisher. Looking at the duties of the RASC in WW2, it still lists one of their duties as ' water purification and supply '. The Royal Engineers, probably took on much larger scale projects. Army transport convoy, led by a ' Dennis ' 3 ton lorry. You sir are a font of wisdom. Just been reading up on mark XI tanks, mentions an amphibious version being tested in Hendon. Very odd! 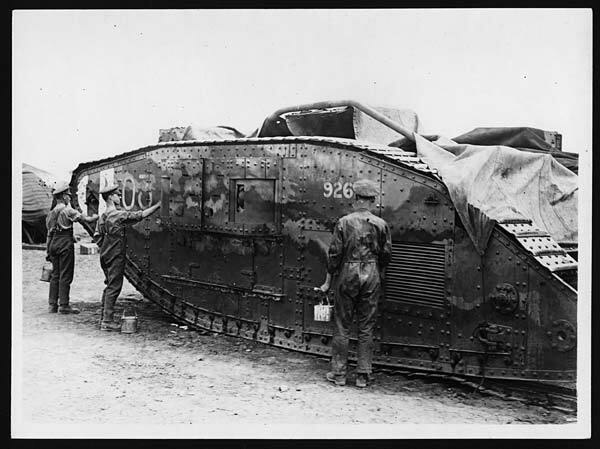 I think that is the only known photograph of the Mk.IX tank tested with floats in the Hendon Reservoir on 11th November 1918 ( Armistice Day ). Only one Mk.IX survives at Bovington. The very real dangers of driving close to the ' Front '. Which Draws Enemy Shell Fire "
Also planning in making the Matador models wireless tank very soon. More information on the water purifiers here. 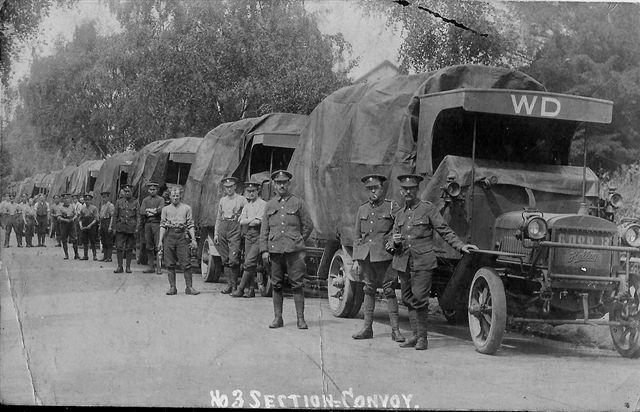 Many thanks for the excellent link, which confirms the series of photographs, and tells us the identity of the unit whose badge is shown on the truck, namely the ASC 718 2 Water Tank (MT) Company, which served on the Western Front, with the Second Army. Formed 20 June 1916 - disbanded 10 December 1919. Their badge attached, shown c/o member Rolfi on that Thread. 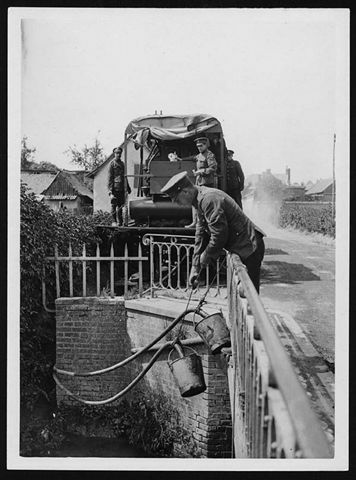 The water testing by the ASC., seems to have been carried out in conjunction with the RAMC., and from the larger photo shown in that Thread, we can see the Lieutenant is from the RAMC. Also, great to see your photograph of the interior of the water testing truck.
" 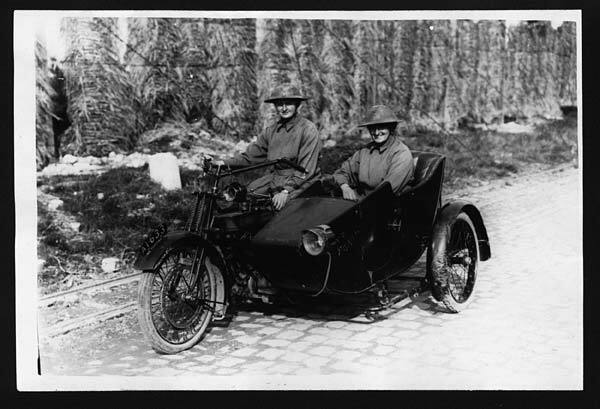 Two British nurses with a motorbike and side-car. They pause for the camera on a cobbled road. They are both wearing overcoats and steel helmets. The bike is a Royal Enfield. According to the photograph's original caption, they are within 500 yards of the front line in Belgium. Original caption reads: 'BRITISH HEROINES IN FLANDERS. 'Angels of Mercy'. Two brave British women that live within 500 yards of the front line in Belgium. " 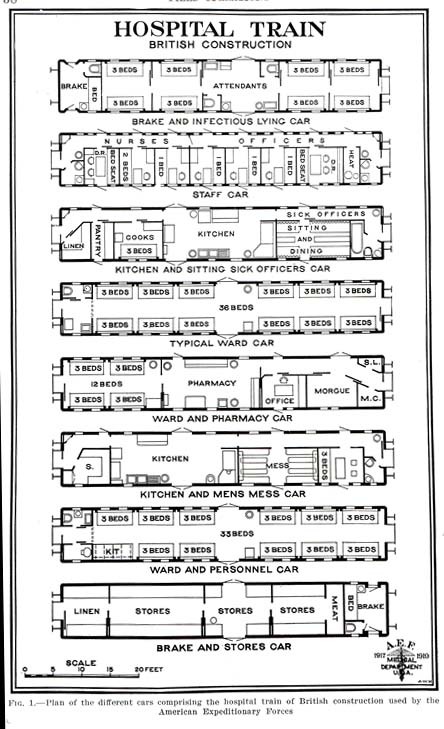 An interesting diagram/technical drawing showing the internal layout of a ' British ' Hospital Train, this was produced by the American Expeditionary Force during WW1. No, I did not know their names, so it is interesting to learn who they actually were. Looking at post # 328, it looks like that same pair of indomitable ladies with their Sutton and Coldfield Ambulance. 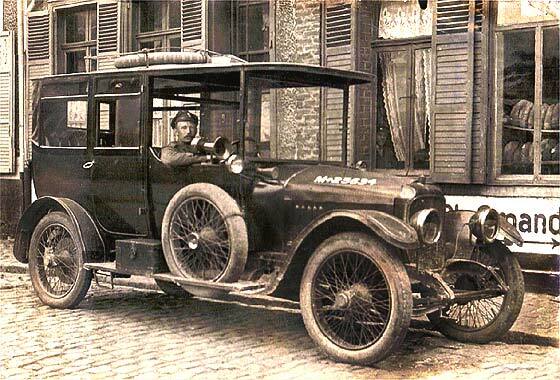 With the dire shortage of transportation, civilian vehicles were acquired by the Army for use in France. 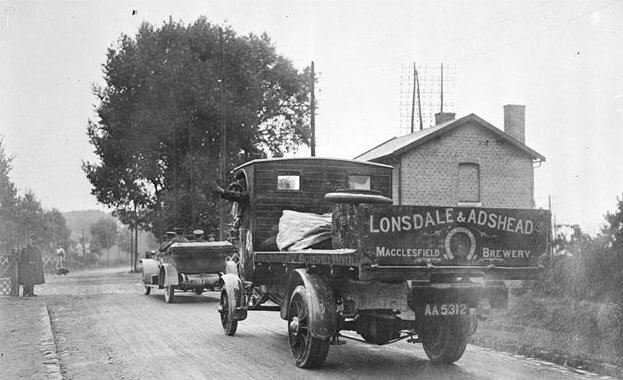 Here we see a Lonsdale and Adshead Macclesfield Brewery lorry following an Army staff car down a French road. A 1913 Vauxhall Type D, used as an Army Staff Car. It doesn't automatically follow that a civilian lorry was requisitioned. 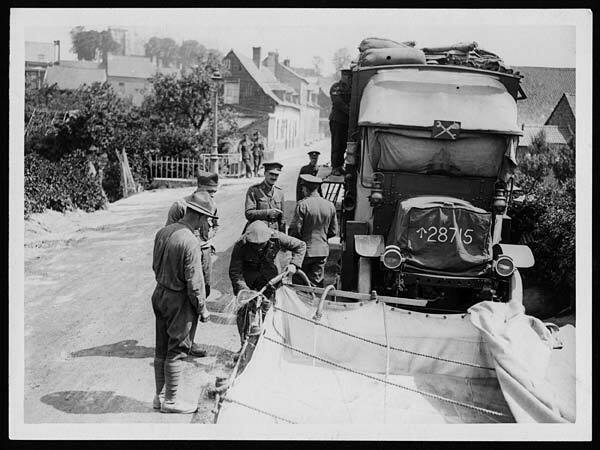 The Army was well aware that it would need mechanised transport in the event of a conflict and there had been a subsidy scheme to assist in the purchase of lorries to create a reserve, the main point being that all such lorries had to be made available to the military as soon as they were asked for.